I’ve always been interested in sewing, from a very young age - I guess living in rural Somerset with little around will do that to you. I remember making a skirt out of scraps of material once - some from former clothes themselves. I set up in my large attic room, sewing machine on the floor, buzzing away for multiple after-school evenings. I sewed wide strips of material together to form an A-line skirt made up of horizontal stripes. Doesn’t sound too bad you’re thinking... But add the fact that the various scraps of material were all of different weights and textures, mismatched patterns and styles… it was hideous. I also tried to make my own prom dress, you know - for THE event of your teen years. This time as part of my art lessons. Only, if you’ve read my post on learning how to draw, you’ll know that my art teacher wasn’t particularly supportive of me or my skills. This, and the fact that I’d chosen a two-tone fabric (appearing pink in one light and purple in the next) which I instantly regretted, meant I had little motivation to pursue with what quickly turned into an impossible feat. Scrap skirts and failed prom dresses aside, I’ve kept up the sewing over the past years - sticking mainly to soft furnishings and accessories - bunting, cushions, make up bags and the like... But I’ve never made anything from a pattern; I've never taken a well thought-through, professional approach. Instead my slap-dash manner normally results in my Mum stepping in to cobble together the parts (something she happens to very good at!). So my next challenge is to make a home sewn dress, something I can proudly wear over-and-over, using a pattern and carefully chosen material specifically for the purpose at hand. I’m extremely excited, if not a little apprehensive! As the ‘make it yourself’ trend is a such a hot topic I thought I’d share my tips and discoveries as I go. If you’re already a dab hand on the sewing machine - I’d love to hear your tips!! Tilly and the Buttons - adorable and fun patterns with endless motivation through their Instagram. I can’t wait to try their Coco dress next time! Tilly and the Buttons also do online workshops and encourage you to share photos of your makings - making sewing that little bit more sociable. Pattern Runway - small selection of patterns with something for everyone - I chose to go for their short sleeved kimono dress below for my first attempt. They also have some great step-by-step tutorials on their blog. Etsy - from vintage Vogue and Simplicity patterns to instant download and print patterns, they have it all from various independent sellers. 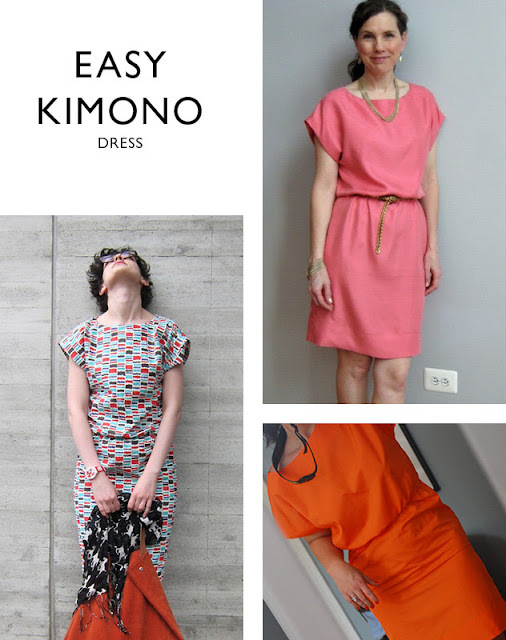 Some successful makers of Pattern Runway's Easy Kimono Dress - love the patterned one! Carefully read the assembly instructions first! And if you are using an instant download pattern you must also be careful when stick the pages together as any minor misalignment could impact on the shape and fit of your garment. Take two and I now have something that looks like a pattern, I’ve taken my measurements, cut out the correct size and now I’m ready to go! Next time, choosing and preparing the fabric... have you got any tips on this front?